Somehow I convinced my generally old school boss to let me work from home today! I woke up so happy that I didn’t have to shower, get dressed, eat breakfast and be out the door by 7:30am. I’m a big fan of leisurely mornings. They are my favorite thing about vacation even if I have to beg my up-and-at-em’ husband to indulge me in them. There’s no better way to start a day than a slow breakfast with multiple cups of coffee and good conversation. So I took full advantage this morning. I got up, did some me-work on the laptop, started the coffee, and had my first cup while looking out the window, watching the steam rise off the pond. I fully enjoyed every moment. It was so much better than having to take my travel cup of coffee to the office and end up drinking cold coffee by 10am. You know, the summer morning commute wasn’t so bad. I was able to get to work in about 35 minutes. Then school started. All those college students commuting into the local universities in the city make my life a little miserable. I can now depend on at least a 45 minute commute. That’s just a much sadder way to start my day. Who doesn’t love staying in your pajamas until noon?! So much more comfortable than business attire. I didn’t have to do my make-up either. Sweet! 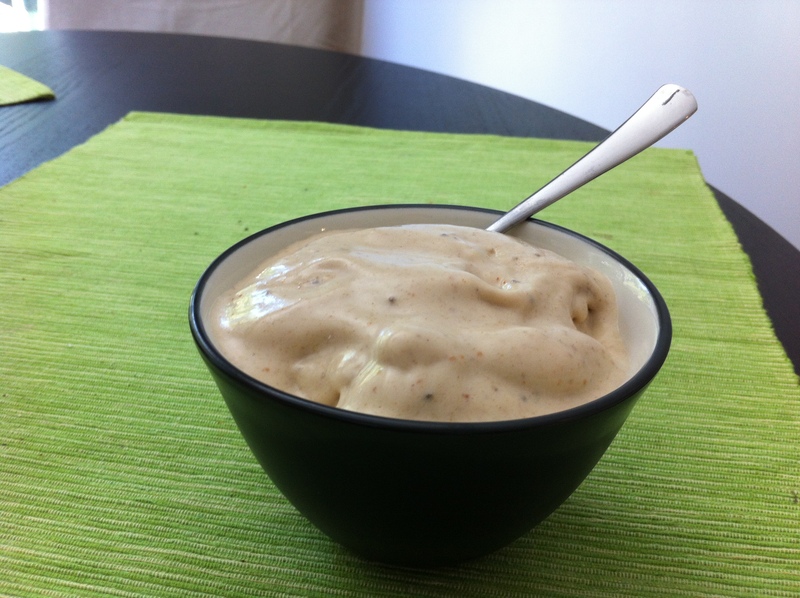 To fully appreciate my “hall pass” day working from home, I made myself some banana ice cream after lunch. If you have never tried this, you need to. This was one of the first things I wanted to make when I got my food processor. Today’s version was so simple. I only needed 3 ingredients: frozen banana, peanut butter, and soy milk. Bonus: this delicious dessert is dairy free and vegan, so everyone can enjoy it! Unless you have a friend that doesn’t like bananas. Or peanut butter. But who needs friends like that? 1. Put the banana, peanut butter, and 2 tablespoons of the soy milk in the food processor. 2. Turn the food processor on. Process the mixture for about two minutes, or until it resembles soft serve ice cream. If it’s still too chunky, add a little more milk. 3. Eat it. You could put it in a bowl first. I did mostly so I could take a pretty picture. You should certainly taste it straight from the processor bowl first, though. I just put two more bananas in the freezer, so I hope I get to work from home again soon. Next Post Next post: These are two of my favorite things…. First off, I love peanut butter. Second I LOVE ice cream! Third, why don’t you work from home everyday so you can avoid rush and work in your pajamas all the time? I work from home and will soon be traveling the world because if you work online you can really work from anywhere you want. I absolutely love it! If it’s something you’d like to learn more about, feel free to connect with me.